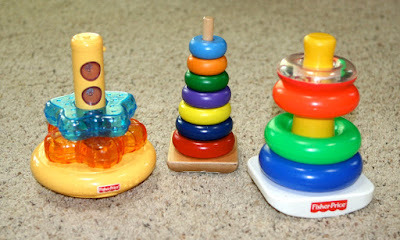 9-12 is the perfect stage for un-stacking objects especially when those objects are brightly colored. I never imagined that my little one would love this "old school" toy as much as she does. As you can see from the picture that she loves these little circles so much that she takes them everywhere. So we are missing quite a few. They will turn up in the most random places. Do you have any ideas for objects to stack or in our case un-stack? Like what you saw? Have a suggestion? Let me know. I love comments! What's Better than a Playhouse? Yeah!!! 1/3 of the way there! Welcome to Made it Mondays! Grandparents Day is Coming...Get Kids Crafting! Who knew? Glass Cleaner actually works! Yummy kid friendly dessert! Marshmallow Pops! Did you wear edible candy necklaces?